Storefront of Carnegie Deli in Midtown Manhattan. The number of old-school Manhattan restaurants got a lot a little smaller in 2016, when the Carnegie Deli—previously one of the longest-operating Jewish delicatessens in the city—announced it was closing its doors after 80 years in business. Less than two years after serving its last hot pastrami sandwich, the Times Square Chronicles reports that the Carnegie Deli will reopen: This time as a retro pop-up selling sandwiches for what they would have cost back in the 1950s. The restaurant is returning as part of a promotion for season two of the hit Amazon series The Marvelous Mrs. Maisel. 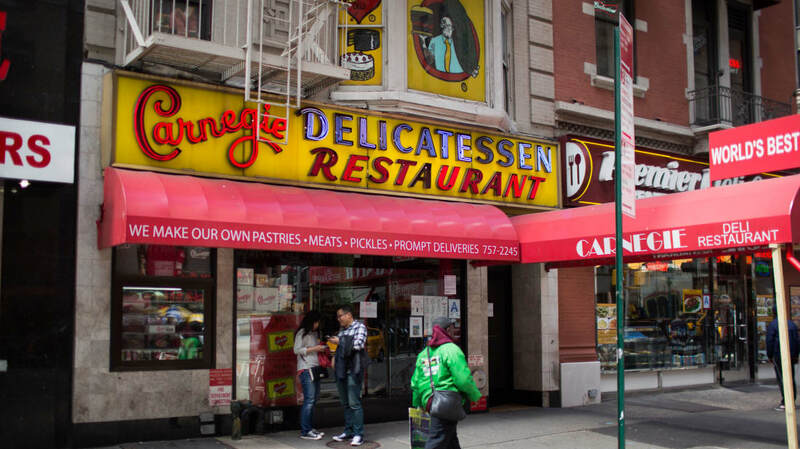 From December 1 to December 8, diners will be able to visit the Carnegie Deli at its new location at 201 Lafayette Street, a couple miles south of its old address in Midtown. In the spirit of the show, which is set in New York City in 1958, the interior of the deli has been transported back to the mid-century. When they're not not eating, customers can play around with the jukebox and photo booth. Even the menu has been updated with vintage prices: The Maisel sandwich, with pastrami, salami, coleslaw, and special sauce, costs $.99; a mini knish is just $.75; and a black and white cookie sells for $.50. For comparison, the Reuben sandwich was listed at $30 when the original deli closed in 2016. To experience a piece of Manhattan history before it disappears (again) for good, you can head to HomeOfTheMaisel.com and add your name to the waiting list. The pop-up will also be accepting take-out orders the week of the December 1, with all proceeds from the restaurant going to the Lower Eastside Girls Club.